It is not as if these six composers have a great deal in common. In only the most generalised sense can they be said to be a �school�. They are identified rather by the fact that they demonstrated no or little sympathy with twelve tone music or for that matter with jazz. Bloch was the only one of the six to be born outside the USA. Hanson wrote in a style I recognise as Nordic but cannot quite pin down. Barber, Creston, Flagello and Giannini form a kind of school - what I might broadly describe as a series of Puccinian-Sibelian subsets. Bloch's later works from the American years were somewhat receptive to dodecaphonic trends. His earlier works were impressionistic and romantic. Flagello also flirted with 12-tone technique. Bloch was an émigré while the others, with the exception of Barber, are second generation Americans born in Philadelphia, New York City and Wahoo Nebraska - the latter being Howard Hanson�s home town. The uniting idea of demeaned traditionalists can be compared with Paul Rapoport's 1978 book �Opus Est�. In the case of Rapoport's volume six European composers were treated each to their own section with a biographical account and technical dissection of one key work. The composers treated there included Matthijs Vermeulen, Havergal Brian, Allan Pettersson and Vagn Holmboe. Walter Simmons� book should be a set text for students of music history everywhere. The marginalisation of some musicians, the primacy of fashion and the brutal interface between economics and arts make for provocative reading. Malcolm Macdonald had already done something similar in his Triad Press book on John Foulds, the introduction to which also shows a real grasp of these issues. 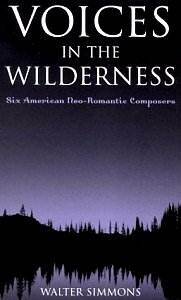 Voices in the Wilderness is in many ways more satisfying to the general reader than �Opus Est�. Biographical coverage is pretty substantial and all major works are given at least one paragraph. This is coupled with notes, bibliography and an essential discography for each composer. Fashion's tectonic plates have shifted towards this music now. Cross-Over, minimalism, world music, film music, the high noon of the CD, the pervasive internet and its scope for information and enthusiasm-sharing have made the music world far more inclusive. There�s room for the radicalism of the sixties and seventies alongside the discoveries of the eighties and nineties as well as for every other genre of music. The book looks and feels good with superb and fitting design by Jennifer Noel Huppert. There is no dust wrapper. Instead the hardback cover is laminated rather like those Pergamon Press books from the 1960s. Walter Simmons is well known as a writer evangelising for lost generations of composers - not because they are lost - not only because they are lost - but because their music is worthwhile. He may not have heard all of it but he knows enough from scores and treasured private recordings to say that if this man or woman wrote this or that work then his other music is worth revival and reappraisal. Maybe some of it will be allowed to slip back to oblivion but only after it has been given its second chance. The value of this book is in its evangelisation through knowledge and reticence. It lacks excesses and overt advocacy. We are not told what to think. We are made curious, intrigued. I hope that existing and new generations will be encouraged to perform this music and when it is recorded to buy the recordings and listen with receptive appraising ears. Slake your enthusiastic curiosity with this well informed and poised book but be prepared to discover new enthusiasms and the nagging grains of a fresh curiosity. Pick this up as a convenient quick read on Barber or Bloch but do not be surprised if you come away with questions seriously disturbing to the concert and recording status quo. At the end of it all you may well be demanding with me why there are no commercial recordings of Giannini's Medead, Psalm 130 for cello and orchestra or symphonies 4 and 5.